(MoneyWatch) In its 13 years, my company has been unusually fortunate in that we have had -- as hard as it may be to believe -- only two or three bad debt write-offs (for very small amounts) and perhaps four or five credit card chargebacks (money taken back by card issuers, typically due to customer disputes or fraud). Other than that, our receivables have always been current. I attribute this partially to good luck, but mostly to careful, disciplined processes and practices, from making open-account decisions, to manually reviewing any suspicious credit card charges before shipping (obviously not possible for all businesses), to being willing to pass up any order if we are concerned about getting paid. Unfortunately, it happens that right now we are dealing with our first-ever serious collection challenge, for a relatively large amount of money, from an otherwise great and longtime customer. I am reasonably confident we will get paid, but we don't know how much or when -- it could take days, weeks or longer. And as anyone in the collection business will tell you, the older a debt gets, the harder it is to collect in full, if at all. So it is critical that we handle this in a manner that is most likely to recover most or all of the debt in the shortest time, with the least drama. Don't get angry, vengeful or personal: This is mistake No. 1 -- immediately thinking of, and treating, a past due customer as an enemy, deadbeat or someone out to screw you. For sure there are some sleazy operators out there, but more often than not, if a good customer has an atypical payment problem, it's because he either faces a short-term crunch or is in real trouble. Both are serious, but neither is meant to hurt you. Odds are you know what it feels like to be tight once in a while, so at a minimum, as in all things business, start from a place of empathy before going on the war path. Work with the customer, not against him: To the greatest extent possible and appropriate to the situation, you should continue to treat the customer like a customer. Be friendly and understanding, and try to come up with options and plans that might resolve the situation with minimal pain and unpleasantness. Can a payment plan be arranged? Is there merchandise that can be returned? Talk it out as partners in the problem, keeping in mind that unless you are in urgent distress, a mutually beneficial and friendly solution is likely to be best. And if the customer is one with whom you hope to do business again, he will never forget how you helped him when he needed it. Communicate often, in writing, and keep records of everything. Always start with a non-threatening written message pointing out the delinquency and asking for the courtesy of a prompt resolution by a specific date. Your early communication should give the customer the benefit of the doubt. Subsequent correspondence can get increasingly firm, eventually pointing out that you will have to turn the account over for collection by a certain date. It's also fine, and often effective, to call a principal at the company if you can, though still follow up in writing. Keep written records of absolutely everything. Turn to a collection service only when all other efforts have been exhausted: Turning an account over to an attorney or collection agency should be an absolute last resort, and for two reasons. First, a collector takes a hefty portion of any recovery; agencies work on a contingency basis, typically between 25 percent and 40 percent of whatever they collect, and may collect far less than what's owed. Similarly, "debt buyers" take over problem accounts for a fraction of their value. And of course, if you use an attorney, costs can add up quickly. 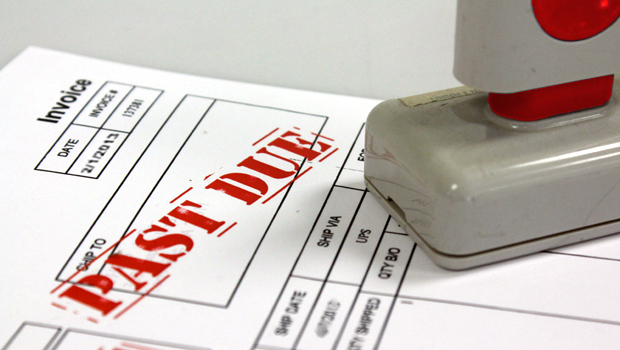 No matter what, you will always end up with less -- often much less -- than what you're owed. Second, as soon as you bring in a collector, the tone of the situation changes. You are now taking aggressive action against the debtor, which you have every right (and at some point a responsibility) to do, but in doing so, you must also accept what that means to the relationship. If the company is having a temporary problem and you go after it with sharpened claws, that relationship will never be the same, if there is any relationship left at all. So be sure you are fine with losing the customer if that's what it comes to. Adjust for the future: As with everything, learn from your experiences. If your policies, the nature of your business or customer base, or other factors are pushing too many accounts to the wrong side of your receivables aging report, make changes. Tighten your credit practices, require deposits, put repeat offenders on C.O.D. -- whatever suits your business and mitigates your risk. And never make reckless credit decisions or take on iffy customers out of desperation for a sale. If you are old enough to remember the line "I'll gladly pay you Tuesday for a hamburger today," you will remember that Wimpy never paid. Anyone who's been around business long enough -- especially small business owners -- will tell you that it's not a sale when you get the "yes," or when the contract is signed, or even when you get the service agreement or purchase order. It's only a sale when the money is in the bank. And unfortunately, at one time or another most businesses have to deal with collection issues. For some businesses it's a rare event, for other companies and industries it is practically an everyday challenge to get paid on time. Don't mistake my approach for softness -- not getting paid is a serious matter and you must do whatever it takes to collect. But payment is more important than punishment, so taking the right steps -- with the right attitude -- will minimize your risk of losing the cash that makes a sale a sale. Please share your own experiences and tips for making sure the money's in the bank.